"Fayose Must Go! "- Women Protest In Abuja, Charges EFCC To Arrest Him. “EFCC Must Prosecute Fayose”, “Corruption is Corruption”, “Fayose is being tormented by the blood of innocent Nigerians slaughtered by Boko Haram." 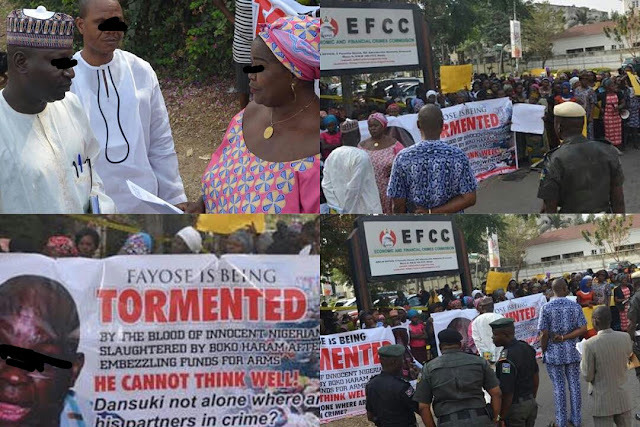 “As mothers, we beg the EFCC to as a matter of urgency, investigate how much Fayose gave lawmakers of Ekiti State House of Assembly who we believe have lost their souls to an overlord".